The first suspect is older and is seen in office as far back as 2015 and as recently as this year. HUNTSVILLE — Provincial police are chasing three moving targets, suspects in multiple thefts of cash from various businesses throughout Ontario and Quebec. A second suspect is younger and appears to have had a moustache three years ago. The trio, who appear to have been in the crime business for at least three years dating back to 2015, often distract an employee while the other gains access to an office where cash floats and deposits are stored. 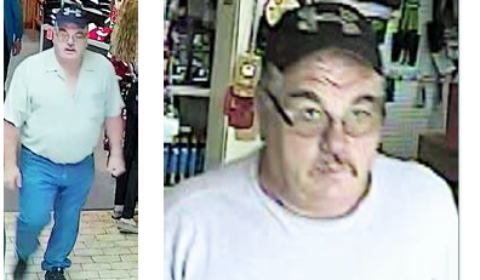 Police have released photos of the suspects in the hopes that anyone with information about them woulld contact the OPP at 1-888-310-1122 or Crime Stoppers at 1-800-222-TIPS (8477). You can submit your information online at www.p3tips.com or if you have any information on this crime or any other crime. Crime Stoppers does not subscribe to call display and you will remain anonymous. Being anonymous, you will not testify in court and your information may lead to a cash reward of up to $2,000.00. You can follow Crime Stoppers of Simcoe Dufferin Muskoka on Twitter or Facebook. The third suspect is moer middle-aged and as of this year heavy-set, and also has a moustache.